The Editors are proud to publish this latest edition of The Defense Line, which features several interesting articles and case spotlights from our members. The lead article, submitted by Patricia Lambert of Pessin Katz Law, P.A. 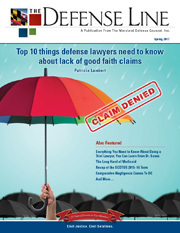 illuminates the many issues that must be considered when handling a “lack of good faith claim” on behalf of an insurer. An article by Peggy Ward of Ward & Herzog, LLC, provides pearls of wisdom from a seasoned litigator on how to prepare cases for trial all inspired by Dr. Seuss. Marissa A. Trassati and Caroline E. Willsey of Semmes, Bowen & Semmes provide what is now becoming a "annual" recap of the Supreme Court’s Term for 2015-2016. John Sly of Waranch & Brown, LLC provides guidance regarding upcoming changes to the Maryland Medicaid law regarding liens. Finally, Mary Malloy Dimaio of Crosswhite, Limbrick & Sinclair, LLP outlines DC’s adoption of comparative negligence for motor vehicle accidents involving pedestrians and bicyclists. The past year has been action-packed for Maryland Defense Counsel. We enjoyed our last Past President’s Reception on the “Terrace” at Tydings and Rosenberg. Their “award winning” view will be missed and we thank Tydings and Rosenberg for sharing it with MDC all these years. We are proud to present the upcoming Trial Academy on April 24, 2017. 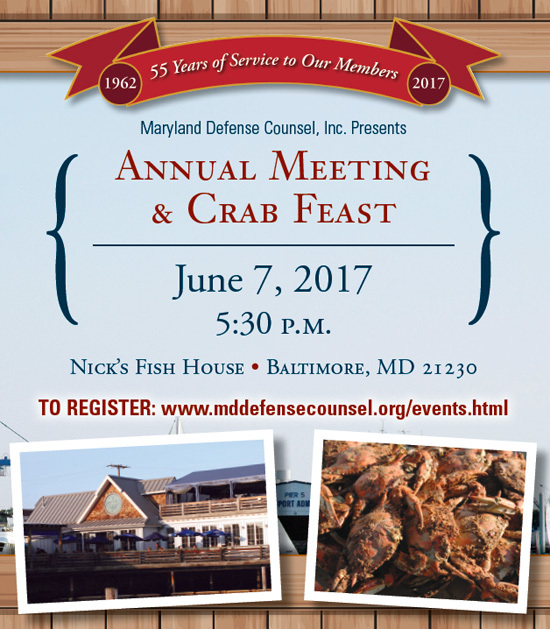 Finally, please make plans to join us for the always and ever popular Annual Crab Feast which will be held on June 7, 2017. The editors encourage our readers to visit the Maryland Defense Counsel website (www.mddefenscounsel.org/events) for full information on the organization of upcoming events. The Editors sincerely hope that the members of the Maryland Defense Counsel enjoy this issue of The Defense Line. In that regard, if you have any comments or suggestions or would like to submit an article or case spotlight for a future edition of The Defense Line, please feel free to contact the members of the Editorial Staff. The MDC expert list is designed to be used as a contact list for informational purposes only. It provides names of experts sorted by area of expertise with corresponding contact names and email addresses of MDC members who have information about each expert as a result of experience with the expert either as a proponent or as an opponent of the expert in litigation. A member seeking information about an expert will be required to contact the listed MDC member(s) for details. The fact that an expert's name appears on the list is not an endorsement or an indictment of that expert by MDC; it simply means that the listed MDC members may have useful information about that expert. MDC takes no position with regard to the licensure, qualifications, or suitability of any expert on the list.